8/24/17 - Meet the Olfa Chenille cutter! Yes, you can make your own chenille at home with this easy-to-use chenille cutter. The cutter has four "feet" serving as channel guides that create chenille in several styles of widths, from narrow to wide, for a variety of creations. Its premium-quality blade provides superior sharpness and durability. 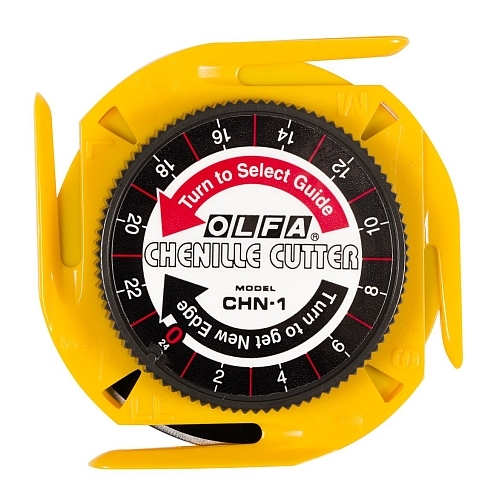 The cutter's ultra-sharp, double-honed circular blade does not rotate and has no exposed edges for your safety. The cutter includes a dual-purpose dial: Turning the dial to the left allows you to select from 4 different channel guide sizes, from 1/8" inch to 1/2" inch. Turning the dial to the right allows you to slightly rotate the blade and expose a fresh cutting edge, which you can do 24 times per blade. 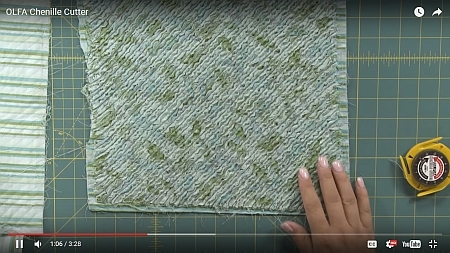 For a brief tutorial which demonstrates how the Chenille cutter works, click above to view a video on YouTube. To view the fabric collection, click HERE. There are a total of 8 clues and the last clue will be available on Saturday, November 3rd so don your sleuth cap and let the detective work begin! Crow Sew - The next scheduled meeting at the Crow will be onWednesday, August 30th at 10am.